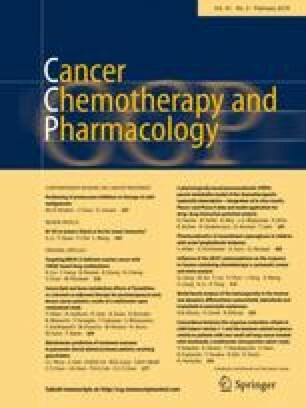 A prospective study was performed to compare the outcome for metastatic breast cancer (MBC) patients treated with docetaxel plus thiotepa (DT) or docetaxel plus capecitabine (DC), and to explore the value of CYP1A1*2C polymorphisms in predicting clinical efficacy of these chemotherapies. MBC patients (n = 130) were randomized to treatment with DT (n = 65) or DC (n = 65). Response rate, disease control rate, progression-free and overall survival were monitored. Genotyping of CYP1A1*2C was performed in all patients. DT and DC produced similar overall disease control rates (76.9 vs 69.2%), median PFS (6.7 vs. 7.5 months) and OS (20.1 vs. 21.0 months) (P > 0.05 for all comparisons); however, DT exhibited a higher rate of control of localized liver metastases (78.6 vs 41.2%, P = 0.023). Among patients homozygous for wild-type CYP1A1*1 genotype (AA), DT treatment was associated with a significantly longer PFS (8.4 vs. 6.4 months, P = 0.019) and OS (33.4 vs. 15.8 months, P = 0.018). Conversely, among patients carrying the variant CYP1A1*2C genotype (AG/GG), DC treatment was associated with a significantly longer PFS (8.4 vs. 5.5 month, P = 0.005), and OS (28.5 vs. 19.6 months, P = 0.010). After adjusting for competing risk factors, CYP1A1*2C genotype was confirmed to be an independent predictor of PFS and OS for each chemotherapy combination. Overall, DT and DC result in similar clinical efficacy for MBC patients; however, efficacy for each therapy differs depending on CYP1A1*2C genotype. The online version of this article ( https://doi.org/10.1007/s00280-017-3500-9) contains supplementary material, which is available to authorized users. This study was funded by Susan G Komen for Cure Foundation (no. SPCHIN1201), Youth Foundation of Beijing Shijitan Hospital of Capital Medical University (no. 2013-q-04) and China Railway Corporation Research Project (2016-A44). The authors declared that they have no conflicts of interest related to this work.